Knocked down a week ago, Virginia Tech answered the call and got back on its feet on Saturday night. Quarterback Ryan Willis and the Hokies (3-1, 2-0 ACC) responded by defeating Duke (4-1, 0-1 ACC) 31-14 in front of 32,177 at Wallace Wade Stadium. Virginia Tech is now 7-0 at Duke since joining the ACC in 2004, and head coach Justin Fuente is 8-1 following a loss at Virginia Tech. Willis waited nearly two years between his last start behind center and tonight. His patience along the way paid off. 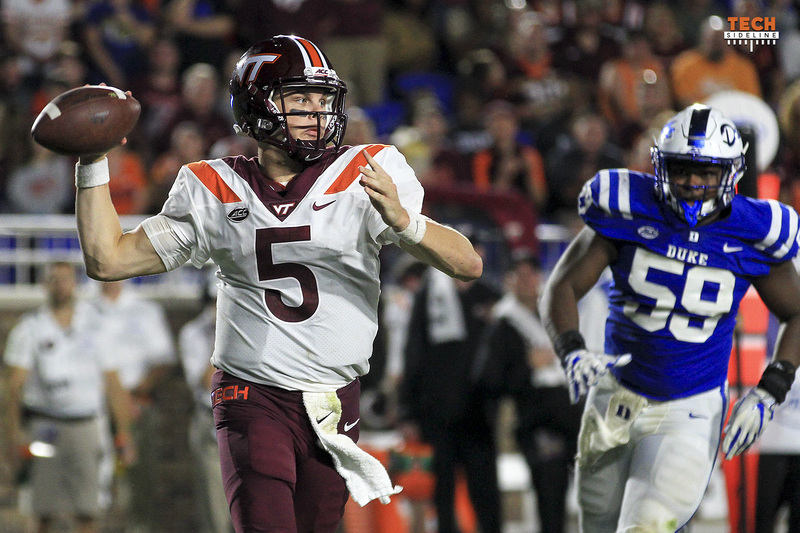 In his first career start with the Hokies, the Overland Park, Kansas native exhibited poise in the pocket, completing 17-of-27 passes for 332 yards, three touchdowns, and no turnovers while replacing Josh Jackson. It was Willis’ third career game passing for over 300 yards, last doing it on October 8, 2016 when he tossed for 348 yards against TCU. “He’s a competitor,” Fuente said. “He was really having fun out there. Certainly wasn’t too big for him. I was pleased with his performance and ability to step up in the moment. Just a day after his 22nd birthday, the redshirt junior was particularly efficient on third down, going 7-for-9 for 123 yards and picking up six first downs through the air. Willis threw a beautiful fade route time after time, allowing his physical receivers to go up and make a play. Following a stunning 49-35 loss to Old Dominion, the Hokies’ critics came calling for Bud Foster and his defense. Foster’s unit pitched a strong performance, limiting the Blue Devils to 327 yards and allowing just 14 points. Duke quarterback Daniel Jones returned to start, tallying 226 yards passing after missing just 21 days with a broken clavicle that he suffered on September 8 against Northwestern. 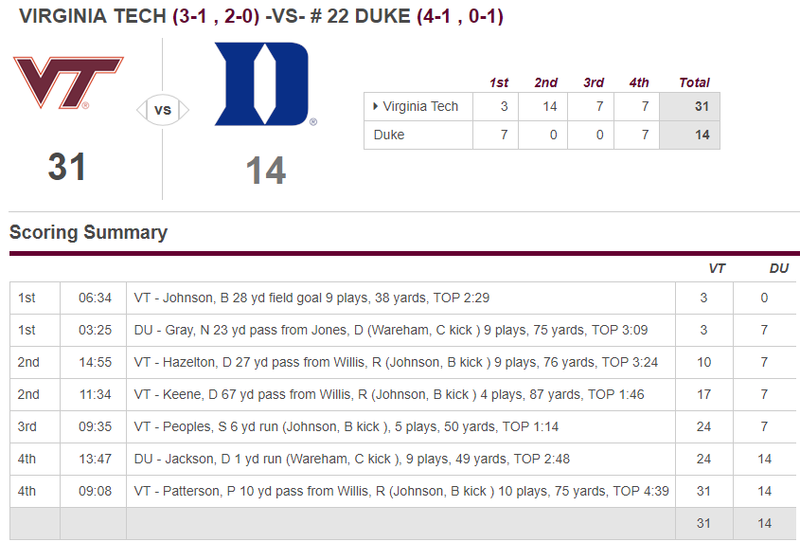 The Hokies held Duke to just 4-for-16 on third down. “I thought particularly our back end kids did a great job of contesting every throw and being in position,” Bud Foster said. “As the game went along, they responded. They took what we coached and made some adjustments on the sideline and took it to the field. 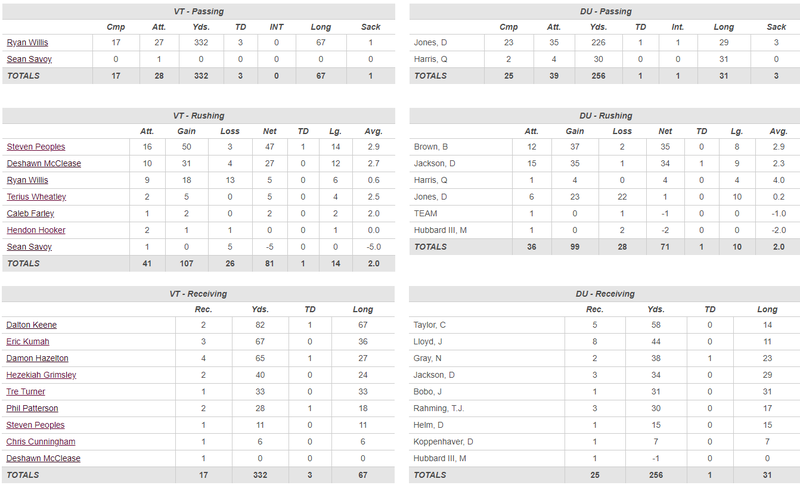 The Hokies applied pressure to Jones by rushing just three and dropping eight most of the night. Houshun Gaines collected 2.5 sacks, in the midst of an emotional week dealing with bad news on the health of his mother. On the heels of a Brian Johnson 28-yard field goal that put the Hokies up 3-0, Duke drove down the field and capped it off with a 23-yard pass from Jones to tight end Noah Gray in the far right corner of the end zone. Immediately after Duke’s score, Willis dropped a dime right over the shoulder into Damon Hazelton’s hands for a 27-yard touchdown. Hazelton has scored a touchdown in four straight games to begin his Virginia Tech career, giving the Hokies a 10-7 lead with 14:55 remaining in the second quarter. Backed in their own territory, Willis connected with Hezekiah Grimsley for a 24-yard gain on third-and-14. On the very next play, Willis dumped a screen pass to Dalton Keene, who took it the distance for a 67-yard touchdown. The sophomore stiff armed a defender, broke a couple tackles, and was sprung the last 10 yards down the sideline thanks to a punishing block by Eric Kumah. The long touchdown gave Virginia Tech a 17-7 lead with 11:34 left in the second quarter. Virginia Tech came out and started the second half with a three-and-out, but got the ball back at the 50-yard line with a fourth down stop. Willis lofted a pass that Eric Kumah went up and got for a 36-yard gain to put the ball inside the 10-yard line. Steven Peoples punched it in from six yards out, giving the Hokies a three-score lead, 24-7. The Blue Devils cut the lead to 24-14 when Deon Jackson jumped over the pile from one yard out for a touchdown. The drive was kept alive when Jones converted a 29-yard pass to Jackson on fourth down to bring the ball to the two yard line. 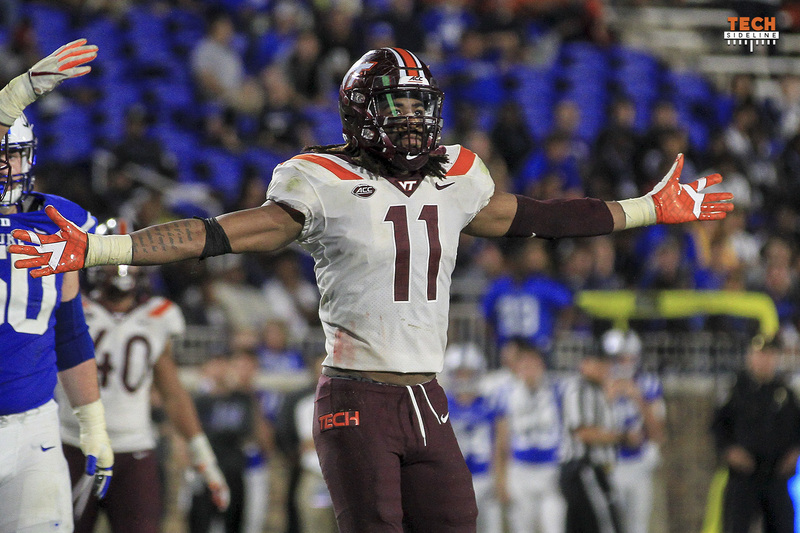 The Hokies effectively closed the door on any potential comeback when Willis connected with Phil Patterson on a jump ball in the corner of the endzone for the quarterback’s third touchdown of the game. Virginia Tech extended the lead to 31-14 with 9:08 left in the game. Virginia Tech returns to action next Saturday in a marquee matchup against No. 8 Notre Dame, 38-17 winners over No. 7 Stanford. Kickoff is scheduled for 8:00 p.m. at Lane Stadium. Rayshard Ashby (15 tackles) and Jovonn Quillen (7 tackles) both tallied career highs in tackles. Virginia Tech was only flagged four times for 26 yards on Saturday. This comes a week after committing 8 penalties for 96 yards against ODU. Duke was one of five teams not to throw an interception heading into the game. That changed when Reggie Floyd picked off a Daniel Jones pass in the first quarter. I first enrolled at VT one year behind Beamer. I can’t stand the Duke basketball team or the coach but it’s Duke not dook. Do you rather we be called the Chokies? Show some respect. I live in NC, and even the Dukies pronounce it as “Dook,”. Just like Clemson alums pronounce it “Klempsin.” Those are real life with nothing derogatory implied. Chokies is jealous Hoo BS and not in the same category, so no idea what your problem is!! If we played the ODU game 100 times, how many times does ODU win? My guess is just the once. There were a dozen plays in that game between great throws, catches, bad calls, and missed tackles that don’t all go ODU’s way in one game again. The lack of Deablo has been understated as well. IMHO, that comment demonstrates a myopic view of what has happened. I can’t help but wonder if it just the draw of something “shiny and new” or why. Everyone is entitled to their opinion, I will choose to trust the professionals in this case, I am sure that the coaches put the player they best think will accomplish the goal on the field. Of course it would be a great story and outcome if RW continues to play the way he did Saturday. He was a complete unknown in the VT system until Saturday, now the ND staff has some tape….I have no doubt they will use it well. I also have no doubt Willis and the VT staff will see that he is prepared well and have a quality plan. Welcome back to the bandwagoners, who bailed when “their team” lost last week. Win , lose , or tie, VT is my team. I’m proud to be a Hokie. I’m 48 years old, and was born a Hokie in a Hokie family. I really wish every Hokie could appreciate having CJF. There are numerous teams who have pursued his employment, and will continue to do so.Take a look at FSU , and all the talent they have yet are still unable to put it together . UCLA and Arizona are both big time programs in desperate need of a good head coach. I do believe CJF is a good coach. Our best days as Hokie fans are ahead of us, THE future is bright!!! The Stallions Eddie Hunter and Maurice Williams. Vaughn Hebron running back with two Super Bowl rings Philly and Denver. It’s almost as if the ODU game never happened. Willis looked great. More of a Fuente-type QB. This is the outcome I would have accepted based upon the first 3 games. So, I am glad to be able to throw that game out. It’s good that our flop game (if there has to be one) came against a non-conference opponent. If we had beaten ODU we may have gone over confident into this game. Duke’s receivers were not as good as ODU’s. I recall 3 deep balls that were catchable by Duke receivers (not easy catches but they had their hands on them) and they didn’t come up with them. They were also smaller than the ODU receivers so they could not use the jump ball strategy. So, I think we are still vulnerable in the secondary. But, how great this feels to be back to being excited about this season and feeling like we can still make the ACC championship game. Only 1 team ranked 20 – 25 in the AP won so I am hoping we will get a spot back in the polls. What impressed me was how it seemed that EVERYONE was taking it as their personal responsibility to step up their games – and for the most part, succeeding. It seemed like pretty much everybody came up big at one time or another – just as it seemed the other way around last week. A very gratifying evening it was, and I’ll admit I didn’t know whether to dare to hope it might come out. Actually, I had very little hope it could have gone this well – was just hoping they might pull off a close win. Figured the offense could get in some scores, but my feeling was that if the defense couldn’t stop or slow down Duke from scoring, it would put too much pressure on the offense to score every time. Bud’s defense answered that call in a big way. As others have noted, this is a VERY young team, and while last week wasn’t pretty or fun to watch, I have to like what I’ve seen otherwise, and see it only getting better. Can we beat ND? Don’t know, but look forward to watching. yes it does seem “everyone” appointed themselves a committee of 1 to up their game and play more cohesively as a team – especially our D. that’s the sign of a team maturing before our very eyes. considering they’re overall still quite young, we may still have some more maturing moments – just not a 60minute game full (like odu) of moments to learn from. having DD back certainly didn’t hurt either. I’m an old timer, having followed V.P.I. or VT for 60-something years. I realize it’s a new era, but I remember the lean years when we got beat but claimed “moral” victories against tough opponents. Moral victories are still a loss in the record books. Gradually those moral victories gave way as the program became a winner, recognized nationally and legitimized by a 25 game bowl streak. So when I read the 2018 headline that Tech “upsets” Duke–the basketball school that was a cupcake in football in my youth–it makes me sick. I have been in seclusion since the ODU game and wasn’t going to watch the Duke game. But I caved, and decided to peek around 8 o’clock or somewhere thereabouts. When I tuned in the Hokies were getting ready to take a 17-7 lead into halftime. I happily watched the rest of the game, except my review of halftime stats had me annoyed with our lack of a rushing game at short of 2.0 ypc. Herr Fuente still has something to work on along the “comeback trail.” We’re not going to beat Notre Dame with such piss poor rushing. Notre Dame has always been a powerhouse, perhaps in name only in lean years. Duke, not so much. Our incompetence at running last night made me want to cry. I won’t list the long line of tough runners and 1,000 yard rushers we’ve had through the years. What happened to that proud heritage? Congratulations Coach Fuente on a nice turnaround last night. You know as well as I do and the rest of Hokie Nation that there is more work to be done. Duke schemed to take away the run and gave up the pass. You take what the D gives. FWIW. yes, OandM, we have to remember dook thought we would be running the ball to keep pressure off RW. Corn and Fuente knew RW’s talent, and what RW is capable of. [dook obviously did not, or ignored what they had heard about RW.] 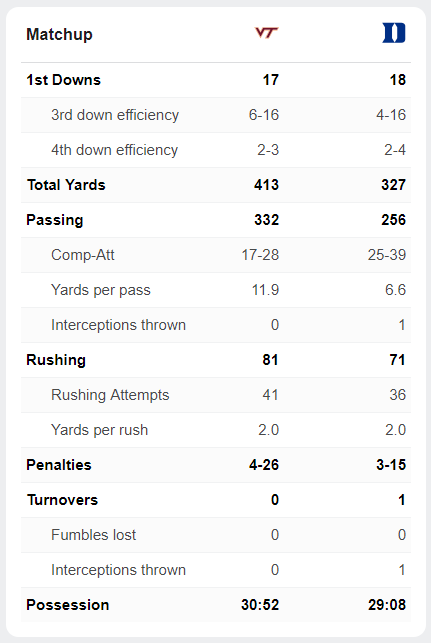 we ran enough to keep dook believing their game scheme was “correct.” and picked up a couple nice terra ferma gains, while RW and the “5 hombres” did too much damage in 1st half before dook’s half time adjustments made the passing game more difficult. OandM, i’m a ’75 and i remember those years of mediocrity, multiple coaches, and a few up’s but more real let-downs. ’69 through ’75 bowl games were new year’s days’ dreams that we never came close to. i’m so thankful that now and in our recent past we’re in a 25 year run of bowl games – yes, i know there’s been a “bowl population explosion”, but the future appears bright; our fairly young coaches are talented, scheme exciting game plans, and are picking up the pace on recruiting; overall our student-athletes are high-quality young men [still weeding out a few who snuck past QC]; and VT alums and students are happier and more are beginning to get more $upportive. 4) lighten up francis on the ODU game – it was a perfect storm day for us, we were thin in the secondary and lost Diablo and that led to confusion and big plays…its over…done…cant change it…own it and let it go…. 5) You calling him Herr suggests he’s to much a disciplinarian for you today – well I want players that represent VT well and are team players – you? Was Adonis a team guy? Mook? Trevon? They had authority and discipline issues and that finally caught up with them…why look the other way when you are build something with youth? I hope you enjoy the season more – regardless of the outcomes! FUENTE will be a feature back guy when he recruits a guy that can be a feature back. it’s not like he has Kevin Jones dressed on the sideline and only gives him 9 carries. We don’t have talent in the backfield like we used too. Fuente is trying to fix that problem but so far hasn’t found the guy. An upper class men Mclease could become the guy and he is improved, People’s is improved. All you can ask of the current young roster is to play to their potential and prepare and practice in that way. Positive factoid: saw Mclease and peoples both making blocks in pass pro to allow the big plays downfield. Totally agree , last week is over we need to support coaches and players. I’m an old codger also (class of 71) and I wholeheartedly agree with your comments! O and M 69 I agree, and really love your passion for the Hokies. Can you list some great running backs that you saw in person from the 1970 to 1995? I am mostly familiar with 1996 to present. I believe he wore number 2 because he was 2 small and 2 fast. I could be wrong, it’s been a long time. Maurice Williams- I think he’s still 3 or 4 on the all time rushing list. 6-0 215 and although not the fastest or shiftiest and hit the hole hard and could make one cut and be gone. I think he averaged something like 5.2 yds per carry for his career if not more. Eddie Hunter was his the shake and bake RB that Maurice wasn’t, they were a great duo. 👍🏼, thanks those were just the names and stories I was hoping to hear about. One of my favorite games was when Suggs and Jones play Marshall and Byron Leftwich and steamrolled the defense all day long. I love watching dominate line play and great backs. Agree with many of your thoughts O&M. I hinted a few days ago, in some earlier posts……i think we are going to like how Willis looks and performs on the field for us. I Like that J Jackson appears to be a clean kid but his play style is too safe and i personally I felt the story about Jackson being a coaches son is totally overexerted. Can’t wait to see what happens as Willis builds more and more chemistry with his receiving and running back arsensal………get ready for the unthinkable Notre Dame. We can’t undo ODU now but we can earn a whole lot of loss-respect back next weekend.